Abstract: One would normally expect that forcing a laser to operate on a wavelength deviating from that of the free-running laser will reduce the output power. The article describes various situations, however, where forced tuning even increases the output power. By using an intracavity bandpass filter with adjustable transmission wavelength, we can tune the emission wavelength of a laser. One would normally expect that the highest output power is obtained when one allows the laser to operate at the wavelength which it would choose itself when no filter is present. Curiously, this is not always true. But let's first ask why we would actually expect the above statement to be true. It is probably because the laser will then operate at the wavelength of highest net gain. But why exactly should this lead to the highest efficiency? Surely, it would mean that the lowest amount of excitation of the gain medium is required, and therefore the minimum possible power is lost via spontaneous emission. However, is this enough to guarantee that the power is most efficiently extracted from the gain medium? In fact, it isn't. Imagine a situation where at the wavelength of highest gain there is also some parasitic loss, resulting from excited-state absorption, for example. One may then obtain a higher output power by forcing the laser to operate at some different wavelength, having a somewhat lower gain but also avoiding that loss. This situation, of course, can occur only when there is a wavelength-dependent power loss, which is sufficiently high to be relevant but also sufficiently weak that it does not affect the laser wavelength. In a somewhat similar case, we could have a very high output coupler reflectivity at some wavelength, but a very small output coupling efficiency, because parasitic losses would destroy most of the generated power. It would again help to force the laser to operate at a wavelength where the output coupling efficiency is higher. The described phenomenon can even occur in a situation where there are no parasitic losses. Imagine that there is gain in two different wavelength regions, exhibiting a significantly different quantum defect. For example, we could have a neodymium-doped laser crystal, strongly pumped around 0.8 μm and having gain around 0.95 μm, 1.06 μm and also in the 1.3-μm region. If the laser resonator offers similar losses for all wavelengths, the laser will normally run at 1.06 μm, where the gain is highest. However, with a tuner we can force the laser to operate at 0.95 μm. As the quantum defect is then lower, it might have a higher efficiency and thus produce a higher output power. Well, this outcome may not be typical, as usually it is harder to obtain a high efficiency in the 0.95-μm region, but there are no fundamental reasons against my claim. Figure 1: Output power and average degree of ytterbium excitation of an ytterbium-doped fiber laser as functions of the emission wavelength, which is enforced with a tuner in the laser resonator. 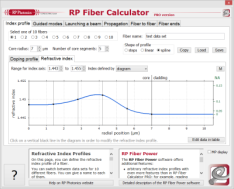 The results have been simulated with the software RP Fiber Power. As another example, consider an ytterbium-doped fiber laser. If the output coupler reflectivity is 80%, for example, the laser will tend to operate at long wavelengths around 1080 nm, where reabsorption is weak. (See the minimum of the gray curve in the figure above.) 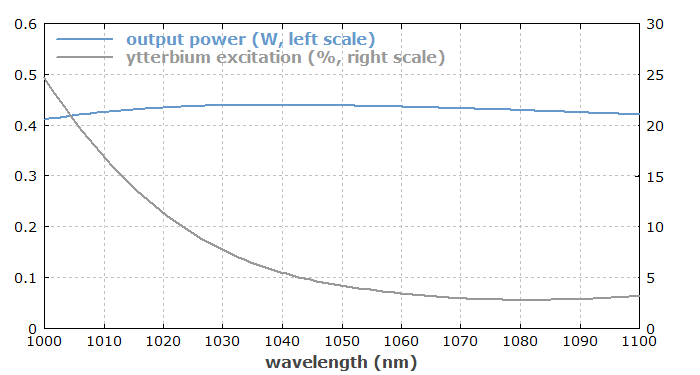 By forcing the laser to operate at 1035 nm, for example, one can obtain slightly more output power, although the average ytterbium excitation and thus the fluorescence power is then significantly higher. Overall, the fluorescence power isn't that important here, as the laser gain is strongly saturated. So we see that for various reasons a free-running laser may operate on a wavelength which does not produce the highest possible output power, and enforcing a different wavelength increases the output power.